Nostalgia comes in all shapes and forms, and we’re the first to acknowledge that not every regular reader of this column will ‘get’ the inclusion of the Mazda Demio. But for those of a certain age, the Japanese supermini-on-stilts is a car that’s firmly ingrained in their conscience. Indeed, for many, it was the very first car they drove, albeit in the Sunday Cup as part of the iconic video game Gran Turismo. Both Gran Turismo and the Mazda Demio come of age this year at 21, with Mazda being one of the primary partners of the games developers back in the early days of the ‘ultimate driving simulator’. As a result, once you’d mastered the art of car control and won the initial Sunday Cup, a Demio ‘A-Spec’ was the star prize - a car you could either modify and tune, or sell for credits to put towards something more prestigious. There are, then, several men (and quite a few women) in their thirties for whom the Demio was a rather iconic car, and one that has become firmly rooted in Japanese car culture not for its brilliance, but for the success of the game around it. It matters not that most people spent their time on Gran Turismo desperately trying to trade their Demios in, which in the real world would have had a catastrophic effect on residual values, as that just made the model even more visible. But what exactly was the Demio? Essentially, it was Mazda’s new-for-1998 supermini, and a replacement for the 121. In styling terms it was much closer to the original 121 than the oddball and bulbous model that replaced it, with a traditional boxy hatchback body. The name was derived from the Spanish ‘de mio’, meaning ‘it’s mine’. Where it differed from more traditional rivals, though, was in its packaging. While the Demio was never really marketed as a lifestyle vehicle in the UK, it has a raised ride height and built-in bull-bar (certainly on early examples) that give it the appearance of a miniature Subaru Forester. That was something that was done for a reason, too. 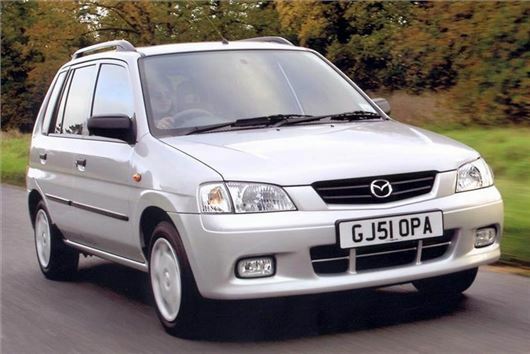 While Mazda in the UK (back in 1998) was largely a brand favoured by the more mature supermini customer, in its domestic market it was a young and vibrant name that young drivers loved. The Demio was all about enjoying yourself. With the back seats folded flat, it was designed to fit two mountain bikes without their front wheels removed, whilst for more spontaneous outdoor types, both rows of seats could be fully reclined and folded into a double bed. Think of it as Japan’s answer to the Austin Maxi, but with better reliability and a pleasurable gearbox, without a long spindly knob that would get in the way of a good night’s sleep. It was brilliant around town, too, with a turning circle to rival a London taxi and light, simple controls. The dashboard was a bit of an Eighties throwback, the fabrics bland and the plasticky switchgear was nothing to write home about, but the Demio was nevertheless a hoot to drive. Part of that driver appeal was down to its revvy 16v 1,323cc engine which, although it didn’t sound that quick on paper, was astonishingly eager; its 72bhp doing their absolute best to get out while encouraging you to thrash it quite hard. The gear change was brilliant, and the handling surprisingly agile. It’s no wonder, really, that it was such a hit in the Sunday Cup. In total, Mazda sold about 7,000 Demios in the UK, of which less than a quarter survive, meaning that it’s well on the way to becoming a very rare car. There are some quirky variants in there, too, such as the Demio Country Casuals, named after the ladies’ fashion brand, and the poshed-up ‘Aegean’ special edition. None of them are worth very much, but that could well be set to change as those that grew up with Gran Turismo look for cheaper alternatives than the five figures needed to buy a decent Toyota Corolla AE86 these days. Plus, if your other half chucks you out for buying one, at least you’ll have somewhere to sleep.